Authorized Employer contacts without direct access, please submit direct deposit information using this submission form or to your account manager directly using an Authorization for Direct Deposit form. You can upload direct deposit forms to us via this secure upload page. All submissions will be re-verified with you by your account managers to insure they were approved by an authorized employer contact. 5. Save at top with Green Checks. 8. 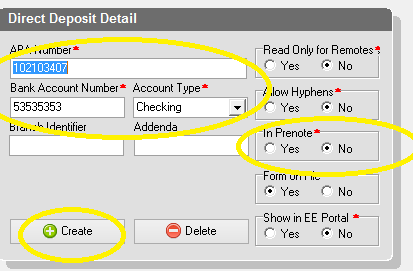 Tie in the Bank Account you just set up; by selecting from drop down on right under EE Direct Deposit. 9. Save work at top with Green Checks. 2. 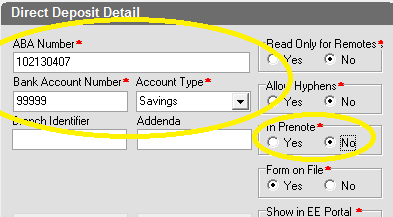 Create a D02 Direct Deposit Savings scheduled item. 4. 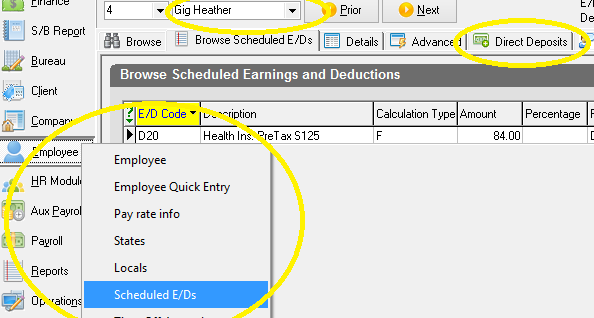 If employee prefers a % of Net Pay instead, change calculation method to % of Net and enter the % in the percentage field. 5. Save your work by entering Green Checks at top.